The Akshaya Patra Foundation, a not-for-profit organization, is focused on addressing two of the most important challenges in India – hunger and education. Established in year 2000, the Foundation began its work by providing quality mid-day meals to 1500 children in 5 schools in Bangalore with the understanding that the meal would attract children to schools, after which it would be easier to retain them and focus on their holistic development. 14 years later, the Foundation has expanded its footprint to cover over 1.4 million children in 10 states and 24 locations across India. The Foundation has centralised, automated kitchens that can cook close to 6,000 kilos of rice, 4.5 to 5 tonnes of vegetables and 6,000 litres of sambar, in only 4 hours. In order to make sustainable use of organic waste generated in their kitchens, Akshaya Patra Foundation has set up anaerobic digestion plants to produce biogas which is then used as a cooking fuel. The primary equipment used in the biogas plant includes size reduction equipment, feed preparation tank for hydrolysis of waste stream, anaerobic digester, H2S scrubber and biogas holder. Vegetable peels, rejects and cooked food waste are shredded and soaked with cooked rice water (also known as ganji) in a feed preparation tank for preparation of homogeneous slurry and fermentative intermediates. The hydrolyzed products are then utilized by the microbial culture, anaerobically in the next stage. This pre-digestion step enables faster and better digestion of organics, making our process highly efficient. The hydrolyzed organic slurry is fed to the anaerobic digester, exclusively for the high rate biomethanation of organic substrates like food waste. The digester is equipped with slurry distribution mechanism for uniform distribution of slurry over the bacterial culture. Optimum solids are retained in the digester to maintain the required food-to-microorganism ratio in the digester with the help of a unique baffle arrangement. Mechanical slurry mixing and gas mixing provisions are also included in the AD design to felicitate maximum degradation of organic material for efficient biogas production. After trapping moisture and scrubbing off hydrogen sulphide from the biogas, it is collected in a gas-holder and a pressurized gas tank. This biogas is piped to the kitchen to be used as a cooking fuel, replacing LPG. 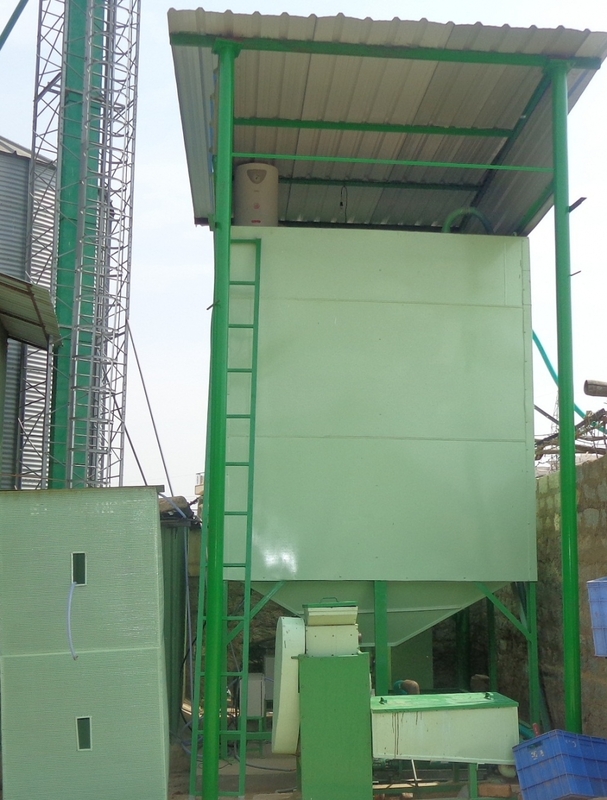 Immediate waste processing overcomes problems of flies, mosquitos etc. Avoiding instances when the municipality does not pick up waste, creating nuisance, smell, spillage etc. Anaerobic digestion of Ganji water instead of directly treating it in ETP, therefore reducing organic load on the ETPs and also contributing to additional biogas production. The decentralized model of biogas based waste-to-energy plants at Akshaya Patra kitchens ensure waste destruction at source and also reduce the cost incurred by municipalities on waste collection and disposal. An on-site system, converting food and vegetable waste into green energy is improving our operations and profits by delivering the heat needed to replace cooking LPG while supplying a rich liquid fertilizer as a by-product. Replacement of fossil fuel with LPG highlights our organization’s commitment towards sustainable development and environment protection. The typical ROI of a plug and play system (without considering waste disposal costs, subsidies and tax benifts) is around three years. Utilization of surplus biogas – After consumption of biogas for cooking purposes, Akshaya Patra will consider utilizing surplus biogas for other thermal applications. Additional biogas may be used to heat water before boiler operations, thereby reducing our briquette consumption. Digested slurry to be used as a fertilizer – the digested slurry from biogas plant is a good soil amendment for landscaping purposes and we plan to use it in order to reduce the consumption of water for irrigation as well as consumption of chemical fertilizers. By 2075, the United Nations estimates the global population will peak at 9.5 billion, an extra 3 billion mouths to feed by the end of the century. Meanwhile, while we produce about four billion tonnes of food annually, it is estimated that 30-50% of this never reaches our plates. Of the food that does reach us, some western societies throw away up to a third of all food purchased. This has enormous implications for the global environment, from wasting the water used to grow the food to adverse effects on climate, land and biodiversity. The drivers behind these phenomenal levels of food waste are complex and include food pricing, logistical and storage issues. However, given the significant level of waste that happens within the households of societies like the UK and US, it is useful and informative to consider those behaviours that drive this level of waste. 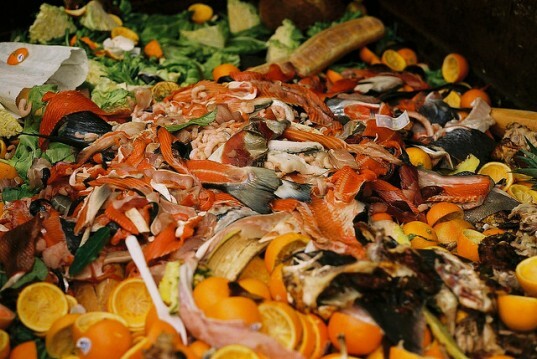 The quality of data around food waste, as with much of waste data, has historically been poor. To this end, WRAP commissioned groundbreaking research in the UK in 2006/7 to act as a baseline to their Love Food Hate Waste campaign. This came up with the alarming statistic that 1/3 of food bought by a UK household was thrown away. Until this time, there had been no comprehensive research, either by food manufacturers, retailers or interest groups, suggesting the importance of government, or some other dis-interested party, taking a lead on the issue. There may be a link between the amount of time spent preparing food, and the skill and effort that goes into this, and the amount of food waste produced. This has led to a loss of confidence in the kitchen, with individuals losing basic skills that allow them to cook with leftovers, understand food labeling, including Best Before and Use By, even basic storing. WRAP had found little evidence of best practice storage advice so carried out the research themselves – leading the (surprising for many) conclusion that fruit such as apples and pears are best stored in the fridge wrapped in a plastic cover. However, this has masked a larger trend of less time spent in the kitchen, due to demographic changes. This of course begs the question – how should we use this when trying to reduce food waste? Should we encourage people to cook from scratch as a principle? Although waste prevention and recycling are clearly separated within the waste hierarchy, there are apparent links between the two when considering food waste. There is an urgent need for legislation to enforce separate food waste collections, not only to ensure it was diverted to anaerobic digestion or composting, but also as it led to greater self awareness around food waste. WRAP research has clearly showed a fall in food waste when separate food waste collections were introduced. Historically, packaging has always been a high priority to the public when asked about priorities for reducing waste. However, as awareness of food waste has grown, a more nuanced position has developed among waste managers. While excess packaging is clearly undesirable, and, within the UK for instance, the Courtauld Commitment has helped reduced grocery packaging by 2.9 million tonnes of waste so far, there is a realization of the importance of food packaging in preserving food and hence reducing food waste. Different political persuasions often differ in the approaches they take to changing behaviours and food waste is no different. In the UK, the Courtauld Commitment is a voluntary agreement aimed at encouraging major retailers to take responsibility mainly for packaging, later growing to encompass food waste, voluntary and so far has seen a 21% reduction in food waste post-consumer. Meanwhile Wales (in the UK) effectively banned food waste from landfill. Scotland has ensured that businesses make food waste available for separate collection – again it’s only once you see it, you can manage it. Campaigns like the UK’s Love Food Hate Waste have been successful but measuring food waste prevention, as with all waste prevention, is notoriously difficult. But, people are now widely aware of food waste as an issue – we even see celebrity chefs actively talking about food waste reduction and recipes involving leftovers or food that is about to go off. There is clearly a balance between food waste and food safety, with a commitment to reducing food waste throughout the retail and catering world, not just at home. By engaging environmental health officers to help deliver this, a potentially conflicting message can be delivered in a nuanced and balanced way. Indeed, environmental health officers in Scotland will be responsible for ensuring that Scottish food businesses present their food waste for separate collection. It is worth considering how the message should be communicated, and by whom. The community sector are more trusted by the public than government and the private sector are more effective at imparting personal, deeply held beliefs – the sort of beliefs that need to change if we are to see long term changes in attitudes towards consumption and hence waste production. Furthermore, communications can engage wider audiences that hold an interest in reducing food waste that is perhaps not primarily environmental. The health and economic benefits of issues and behaviours that also result in food waste prevention may be the prevalent message that fits with a particular audience. So whilst the main aim of a training session might be food waste prevention, this is may not be the external message. And this has wider implications for waste prevention, and how we engage audiences around it. Municipal authorities tasked with waste prevention will need to engage with new groups, in new ways. They will have to consider approaches previously considered to be beyond their powers to engage new audiences – should they be partnering with public health authorities with an interest in nutrition, or social housing providers that are focused on financial inclusion. Should waste prevention even be a discipline in itself? After all, across material streams it is a motley assortment of behaviours with different drivers. Furthermore, with the knots that one can tie oneself in trying to measure waste that doesn’t get generated, – therefore doesn’t exist – should we integrate waste prevention in to other socio-economic programmes and position it as an “added benefit” to them? Note: The article is being republished with the permission of our collaborative partner be Waste Wise. The unabridged version can be found at this link. Special thanks to the author Mike Webster.